As we’ve discovered, Gen Zers are ruthless in their pursuit of what they want. Well, perhaps ruthless isn’t the right word, but they definitely have more power than they typically get credit for when it comes to purchases by mom and dad. 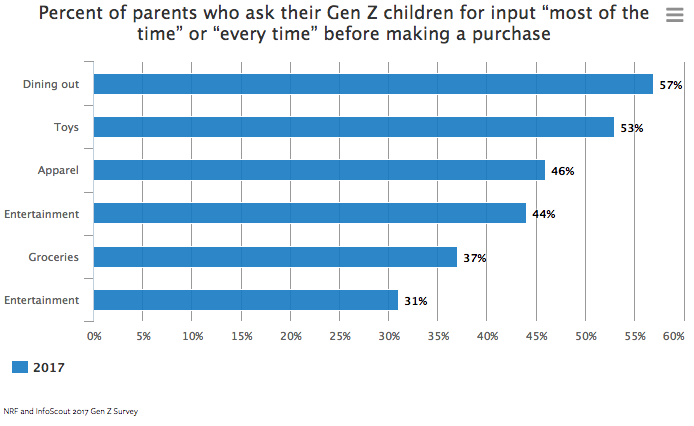 In fact, when Gen Zers and their parents shop together, all bets are off. According to the Journal of Consumer Marketing, it’s been found that with kids in tow, mothers will spend up to 30 percent more. This is what we like to call the “pester power” of Gen Z. Never underestimate this ability, as these kids and teens are expert verbal negotiators with unique bribing tactics – from promising to get better grades to taking on more household chores to cutting into their own piggy bank. And it’s working, as YouGov Omnibus Parents Survey found that 42 percent of parents will admit to having “buckled under the pressure” of their child’s attempt to get them to buy a particular product. Additionally, the National Retail Federation and InfoScout recently conducted a poll that found 67 percent of parents get their child’s input before making a purchase and 59 percent won’t buy an item of which their child doesn’t approve! This has most powerfully impacted the sectors related to apparel, e-commerce, entertainment, fast-moving consumer goods, restaurants and specialty retail. But regardless of vertical, the entire retail industry is clearly experiencing a massive shift in not only the consumers they are attempting to reach but also in the expectations of how they reach them thanks to this Modern Consumer Mindset™. Want more on Gen Z? Stay tuned for our new book, Marketing to Gen Z, coming Spring 2018. Pre-order here!